Add thousands of Multiplayer Servers automatically to Minecraft PE! Add with a single click any Minecraft PE (Pocket Edition) multiplayer server. We update the servers in Real Time. It is the only app with which you can add all the Multiplayer Servers you want without any limit. – From this app you can add / remove Servers from your Minecraft PE (pocket edition) app. – You can instantly see players, mods, plugins, status, number of users and types of games. – Real-time update of all multiplayer servers. – Search engine, so you can find your favorite servers better. 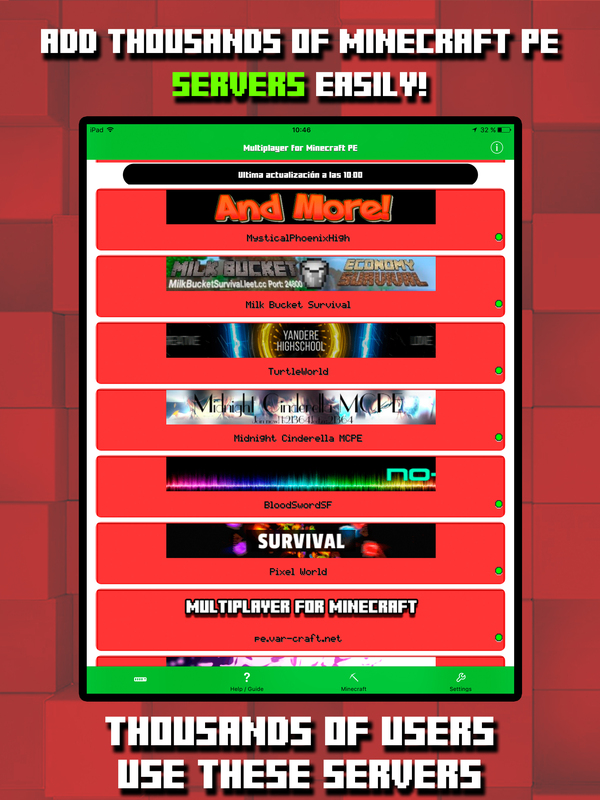 With this app you will be able to access the most famous Multiplayer Servers in the world and be able to play with thousands of Minecraft friends.